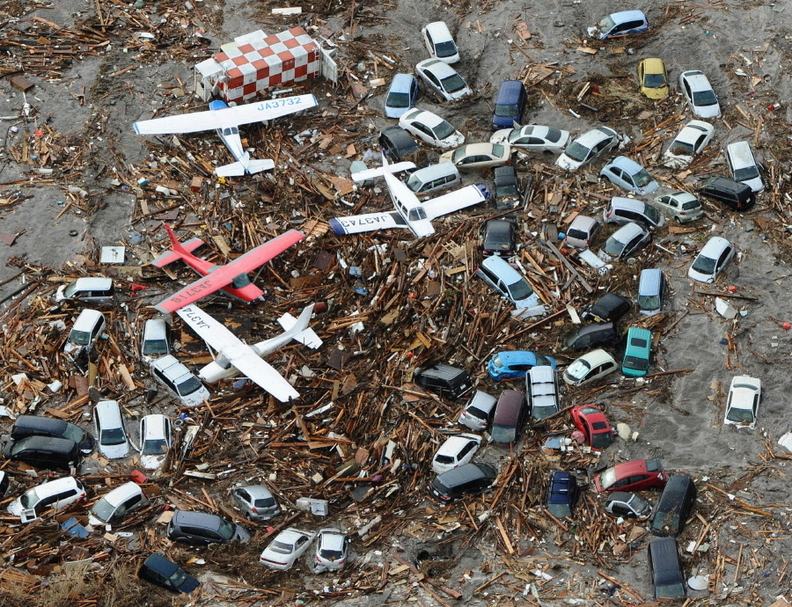 Cars and airplanes swept by a tsunami are pictured among debris at Sendai Airport, northeastern Japan. A massive 8.9-magnitude quake hit northeast Japan on Friday, causing 10-meter (33-foot) tsunami along parts of the country's coastline that authorities believe killed hundreds of people. TOKYO -- Toyota Motor Corp. stopped production at plants in northern Japan today and was assessing damage after a 8.9-magnitude earthquake struck off the coast, shaking buildings violently as far away as Tokyo. The world's largest carmaker, said it was evacuating workers from several factories in the quake zone. Toyota has two parts plants in northern Japan and it has two affiliates, Kanto Auto Works, Ltd. and Central Motors Co., that assemble small cars in the region. The immediate status of those plants was still being evaluated, Toyota spokesman Dion Corbett said. "We are still trying to get information from them," he added. The quake struck at 2:46 p.m. local time off the coast of Sendai north of the capital, the Japan Meteorological Agency said. The tremor also triggered a tsunami that flooded coastal areas. Television footage showed cars being washed down flood zones like toys and large capsized cargo ships tossed sideways and jumbled together in port. Aftershocks rocked, many strong, the region for hours afterward. Toyota is one of the few Japanese automakers with a large manufacturing presence in northern Japan, a region it wants to make a center for small car production. In January, its Central Motors subsidiary opened an new assembly plant just an hour's drive away from Sendai. That plant, with a capacity of 120,000 vehicles, makes the Yaris small car for export to the U.S.
Toyota's Kanto Auto Works has another assembly plant in the neighboring prefecture of Iwate. That plant also makes small cars, including the Yaris sedan, the Scion XB and Scion XD for export. The Toyota parent company has two parts plants in the region as well. "As for production from here out, we will make a decision after we get a handle on the situation," Corbett said, about when the northern plants would reopen. Toyota plants near the company's headquarters in Toyota City, in central Japan, had resumed production as normal after brief shutdowns, Corbett said. There were no reports of injuries from those factories. Possible damage was still being assessed. Toyota was also confirming damage at its suppliers. Nissan Motor Co. has also suspended operations at factories throughout eastern Japan. Small fires broke out at two assembly plants, including the factory producing the Infiniti M sedan and GT-R sports car. They were quickly extinguished, the company said. The automaker also evacuated employees from its technology center south of Tokyo after the power was cut off there. Nissan said plants would stay closed over the weekend. It will decide whether to resume production on Monday after assessing the quake damage. At Honda's r&d center in Tochigi prefecture, one person died and 30 were injured when the quake toppled a wall at the facility's cafeteria. No other injuries were reported. Honda shut down two assembly plants immediately after the tremor, Keitaro Yamamoto, a spokesman for Honda said, but one of them, the automaker's Suzuka plant in central Japan soon resumed production. But the company's Sayama plant, north of Tokyo and closer to the quake's epicenter, remained closed late Friday evening. Yamamoto said the company was unsure when production would resume there and added that Honda headquarters was having difficulty contacting its plants. Toyota Boshoku Corp., a Toyota Motor supplier, reported damage at a plant in Miyagi. Roads were also cracked near its factory, said Misako Nagata, a spokeswoman for the parts maker. Denso Corp., Japan's biggest auto-parts maker, said a plant under construction south of Miyagi was damaged. All of its workers were safe, said Goro Kanemasu, a spokesman for the company.